Low budget British cinema often has a stigma attached to it. People think that it’s just dark, gloomy, depressing social realism. That description sums up ’71 pretty well but don’t let that put you off, the film is so much more. ’71 showcase the best things British cinema has to offer, showing the world you don’t need lots of money to make an outstanding film. It’s brutal, tense, brilliantly directed and acted, and is one of the best British films in years. Out now on Blu-Ray and DVD comes ’71, which follows British soldier Gary Hook (played by 2015’s BAFTA Rising Star Award winner Jack O’Connell) as he is deployed in Belfast during the conflict between Catholic Nationalists who want Northern Ireland to join the Eire and Protestant Loyalists who want Northern Ireland to remain part of the UK. Under the command of an inexperienced leader his regiment are sent in for protection duty only to quickly retreat. One problem though, Hook gets left behind, surrounded by people who want him dead. Between the IRA and a group of corrupt undercover British agents, Hook’s chances of getting out alive look pretty slim. Imagine a British version of Black Hawk Down with all the unimportant aspects stripped away leaving a short, tense, uncompromising thriller and you wouldn’t be far off. The film is directed by newcomer Yann Demange. He directs the film with such ferocity that you might occasionally forget to take a breath. And apart from a couple of instances, the film never really lets up. One particular moment where Hook (and the audience with him) can finally take a breather and rest up is suddenly, and explosively, disrupted before the film grabs you again and doesn’t let go. This is aided by a quiet eerie soundtrack, and sometimes lack of soundtrack, that makes the action seem real and believable, and just all that more frightening. The film also doesn’t take sides in the conflict and both sides are seen as a mixture of individually good and bad people. Perhaps the undercover British agents are shown a little too one dimensionally, but this doesn’t let the film down. The film’s star, Jack O’Connell does a brilliant job here as Gary Hook, the films scared, mostly silent protagonist. O’Connell makes Hook scarily ordinary, and he certainly isn’t an action hero. He may stalk around with a knife at one point in the film but he’s more horror film final girl than John Rambo. He only fight’s back when he’s got no other choice and even then he doesn’t do a particularly great job of it. He’s just a normal guy in extraordinary circumstances and O’Connell really highlights this, often without saying a word. That’s not to say the film doesn’t have its share of action thriller moments though. There’s a great scene early on in the film that feels reminiscent of the classic foot chase in 90’s action classic Point Break. Demange shoots these scenes in a shaky cam sort of way but unlike most examples of this, it works. Everything that needs to be seen is seen and the shakiness helps emphasises the confusion felt by the protagonist. In fact the film does this well throughout, intentionally never going into too much detail about events so we as an audience have as little context as our beaten, confused protagonist. The supporting cast are all top notch too and none of them outstay their welcome. For the most part they are just stops on Hook’s horrific journey and their fates are left unanswered. Hook wouldn’t know what happened to them so as an audience we don’t either. But this works and again leaves us as on edge and confused as Gary Hook. If you want a film that recalls the Irish troubles in the 1970’s in perfect historical detail then ’71 isn’t it. The film isn’t bothered with religious differences or painting either side as good or bad. Instead ’71 is focused on being a taut, tense, edge-of-your-seat thriller and in that it succeeds. 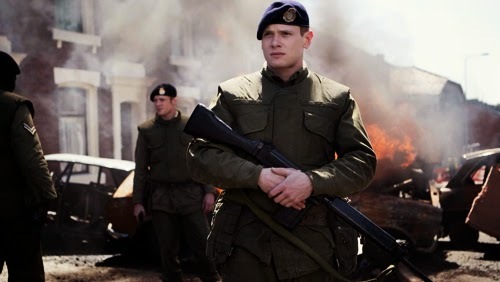 The film is an excellent example of low budget British film making done right and is a showcase of up and coming star Jack O’Connell’s talents and the talents of first time film maker Yann Demange. ’71 gets an excellent 5/5. It produces revenue from the carrier and also transportation fees, along with stamps. liteblue usps with the listing of locations or subjects they need to know around.